Mix the water and salt in a bowl. Mix until the salt dissolves. Add the flour little by little. Mix with your hands in circular motions and using your fingers to break about the lumps that might form. Let sit for 5 minutes to allow the mixture to thicken. Add the cheese and knead until well combined. Heat the oil in a deep pan over medium high heat until it reaches a temperature of 350°F. Divide the dough into 12 equal parts. Create balls and flatten softly until you have disks that are 1/2 inch thick. Fry the arepas in threes for 2 minutes on each side or until they've browned. Place on a dish with paper towel to remove the excess oil. Serve hot with a guasacaca sauce, if you'd like. If the dough is too soft, add a bit of flour. If it's too hard, add more water. As a Venezuelan, there isn't a food I identify with more than arepas. Arepas are like our daily bread. We eat them for breakfast, lunch and/or dinner. They are never missing from the table. Not only do they fill our stomachs with food, they also fill our hearts with pride. This recipe that I'm sharing with you today fills me with double the pride because this was the first recipe I prepared with my very own hands at a young age. I remember that my mom would prepare the dough and I would be in charge of making the little balls. She would then fry them. The arepas wouldn't come out particularly round, but the taste is what mattered most. 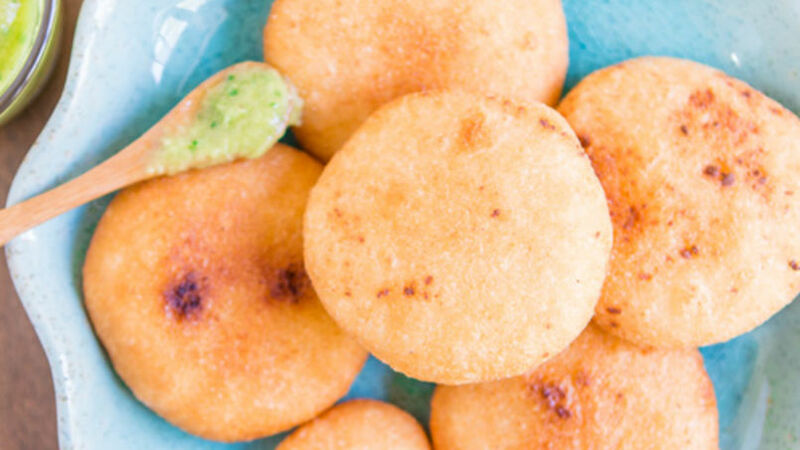 I prepare these little arepas for my children regularly and they love them! What dish filled you with pride?